Detective Rochelle is a dynamic, entertaining speaker. She will address Situational Awareness - being aware of our surroundings, realizing when something is out of place & what to do about it, Personal Safety Tips - when in public, driving and at home and Elderly Exploitation/Avoiding Scams - financial exploitation of an Elderly, Disabled or Impaired Adult, how to identify and report crimes and avoiding scams. 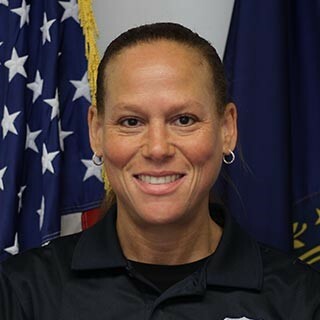 Detective Rochelle Navelski is a Portsmouth native, Portsmouth High School graduate, full time police officer since September 2002, served in the U.S. Army Military Police Corps as a corrections specialist at Ft. Leavenworth, Kansas, a corrections officer at the Strafford County Department of Corrections. She has a degree in Criminal Justice from Hesser College, while working as a residential counselor at the Chase Home for Children. A detective since 2009, she was the PHS school resource officer and developed an iPod registration program that eliminated the ongoing theft of students’ iPods (a program which received international recognition). She was also assigned to investigate a wide variety of felony level offenses. In 2016, a newly created position of Community Outreach Coordinator tasked her to build and maintain relationships with the community, local organizations and act as the department liaison with frequent service providers. She is the department coordinator for Seacoast Crime Stoppers, Citizen Police Academy, CRASE (Civilian Response to Active Shooter Events), ALICE (Alert Lockdown Inform Counter Evacuate), Youth Summer Basketball League, and Senior Services. She is a member of the regional New Hampshire Financial Abuse Specialist Team, Dementia Friendly Action Team, and was the 2015 recipient of the Martin Luther King Community Service Award in recognition for representing community policing. Detective Navelski is a hardworking, friendly, and compassionate individual who is dedicated to, and genuinely cares for the community in which she was raised, lives, and continues to serve today.